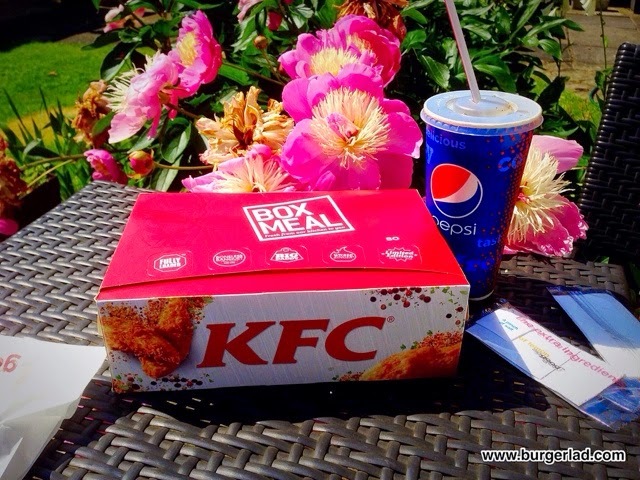 KFC Carnival Box Meal - Price, Review, Calories & More! Dance all the way to your nearest KFC for our show stopping Carnival Fillet Burger. 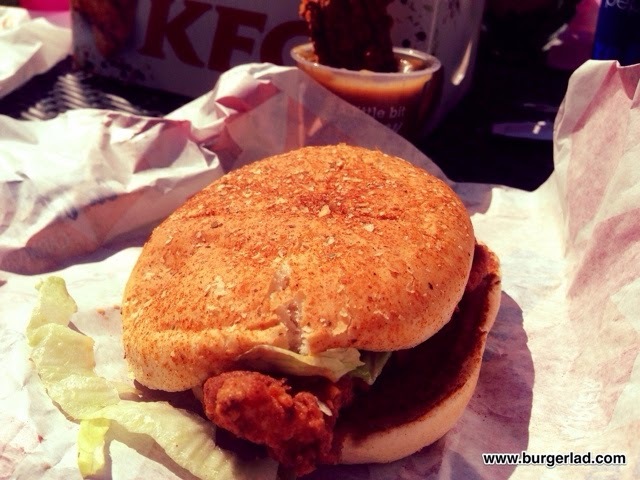 An Original Recipe chicken fillet, crisp lettuce and Fiery Carnival Chilli mayonnaise all encased in a herb topped bun. 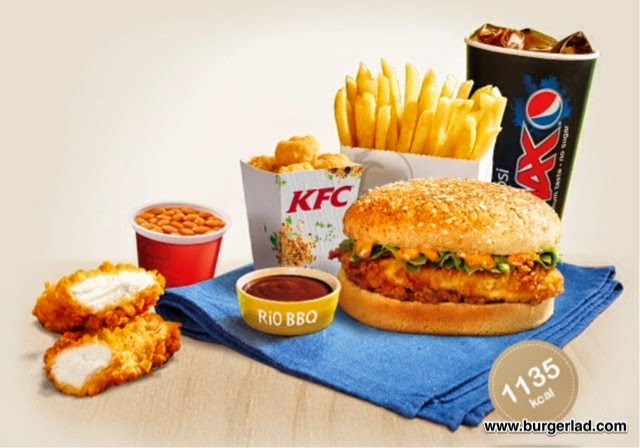 Served with a Rio BBQ dip, Mini Fillet, small Popcorn Chicken, regular fries, a side and regular drink, it’s a meal that will make you want to samba. 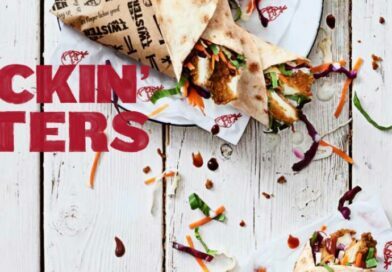 Cost: £10.95 (including three extra pieces of boneless chicken. This was a motorway KFC though, so high street ones may be cheaper). England v Uruguay tonight. 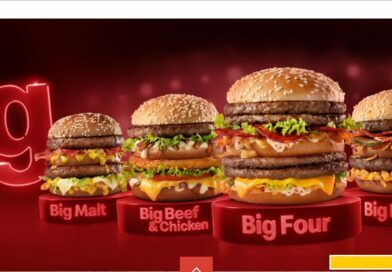 We’ve seen a lot of football-special burgers kicking around (ha ha) and Burger Lad® has rounded them all up comprehensively for us here but quite oddly here in the UK we haven’t had any football specials. KFC however, has sort of given us something Brazilian. The Carnival Box Meal. It’s a chicken burger with fiery mayo, fries, a drink, a piece of boneless chicken, and a side (in my case gravy). 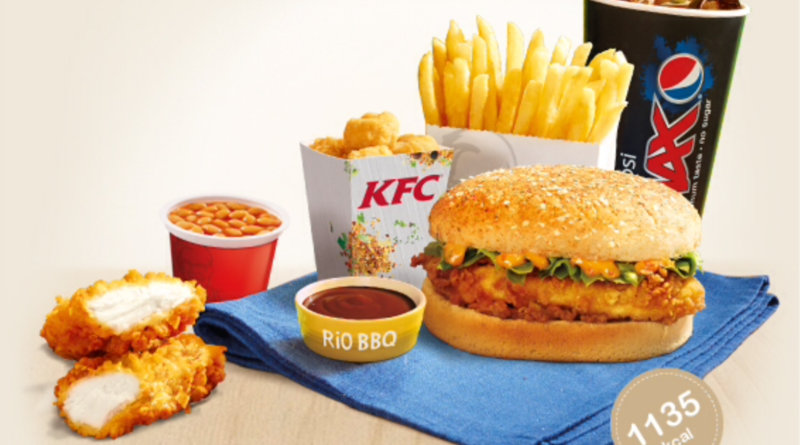 So, as Britain sits down tonight to support the only one of our four home (and ten total) teams to get to Rio, how close does the Carnival box meal make me feel to the action? Answer, not very. I don’t know what’s particularly Brazilian about it, and it’s not very football, but it is, however, rather nice. 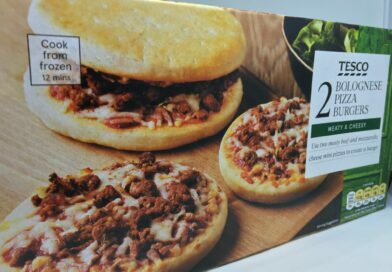 The box meal itself is big. 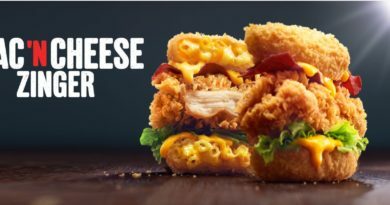 Having a chunk of tasty chicken as well as a little box of popcorn chicken and some fries, on top of the burger, seems like a lot, but frankly it’s listed as 1,135 calories, I’m assuming for the lot, and that seems quite low. At kick-off, I tuck into the fries. 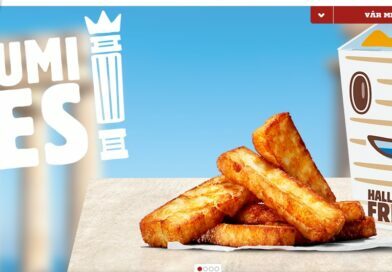 The Admiral has never been a great fan of KFC fries and today’s no different. They just don’t have the crispness I prefer. 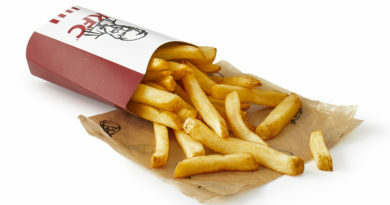 The place isn’t Kentucky Fried Fries though, and the chicken more than makes up for it. Personally, I really like the secret stuff KFC chicken is done in, so I ordered three extra pieces to go with the one I got in my box. These boneless pieces are great, and less messy than the chicken on the bone. I really, really enjoyed dipping them into the gravy (which was definitely more “Britain” than “Brazil” but so what). This is inside the box…! The popcorn chicken isn’t as nice as the big chunks but it isn’t awful. They went into the gravy too! A sideways pass to the burger itself, and having a look, the herb topped bun looked interesting. It adequately held in the contents, and the burger bit of it was effectively another (a fifth) piece of KFC boneless chicken. Biting in, the so-called fiery chilli mayo wasn’t very fiery. 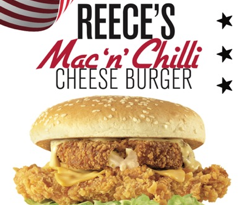 This seems to be a usual thing at the main chains – they never roll out the big chilli guns. I’m quite happy with that really, not being a fan of over-spiciness, but in this case a little more pizazz wouldn’t have gone amiss. At half-time I took stock. This large box meal was going down easily. Tasty crunch chicken and all. It’s testament to how nice it was that that was the case. The burger was very nice, pep notwithstanding. 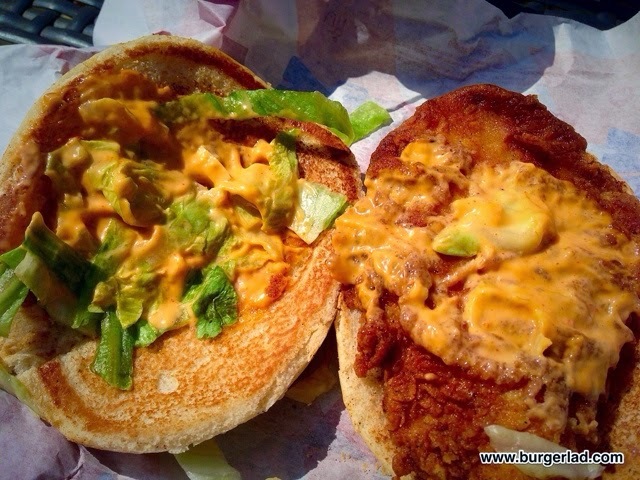 The seasoning on the bun did stand out and I don’t find that usually happens. There was just enough heat in it to get a slight hint of chilli build-up in my mouth, but the crunchy chicken smothered in that sauce, was great. Despite the carnival / Rio theme to it, the bit I enjoyed the most was dipping the chicken into the gravy and somehow I hope that is some sort of omen that England will triumph tonight. 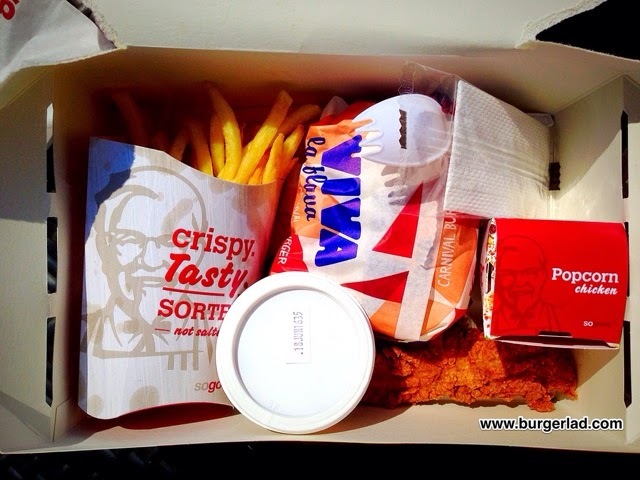 The KFC Carnival Box then. A big meal with lots of stuff. While perhaps not living up to its name, it satisfies and is downright tasty, and as a result, I can recommend it. Grab one before England have to come home. Good review Admiral. 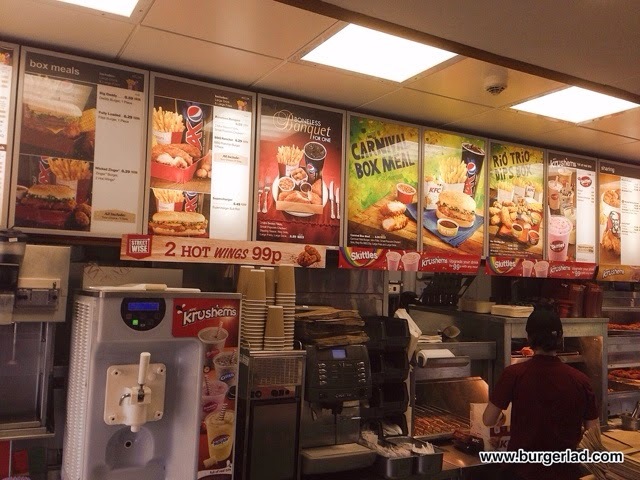 £10.95 is a lot of money for a fast food service meal! It is, but it did include an extra three pieces which was my choice- plus it was motorway prices. I think under normal circumstances, without the extra chicken, and on a high street, it'd be a lot less.